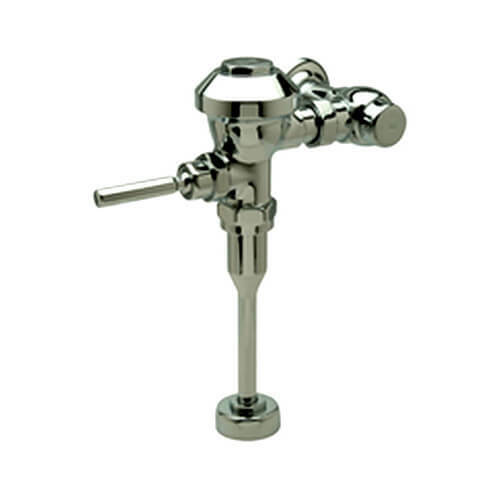 Flush Valve -- Exposed, quiet diaphragm-type, chrome plated .125 GPF flushometer valve with a polished exterior. Complete with Zurn's AquaVantage TPE, chloramine resistant, dual seal diaphragm with a clog resistant, filtered by-pass. The valve is ADA compliant with a non-hold open and no leak handle feature, high back pressure vacuum breaker, one piece hex coupling nut, adjustable tailpiece, spud coupling and flange for top spud connection. Control stop has internal siphon-guard protection, vandal resistant stop cap, sweat solder kit, and a cast wall flange with set screw. Internal seals are made of chloramine resistant materials.